One of the keys to cooking at home is to have an arsenal of easy, go-to recipes that you can pull off dependably and quickly with ingredients that are almost always on hand. I’ve recently came up with a steak marinade that fits the bill. It’s simple and delicious–great with the the flavorful “bargain cuts” that I usually grill, such as hanger steak and tri-tip (I can’t even tell you the last time I bought a ribeye or strip steak–meat has gotten so insanely expensive, no?). This marinade is best made with a mortar and pestle, but you could also just chop everything up very finely if you don’t have one. 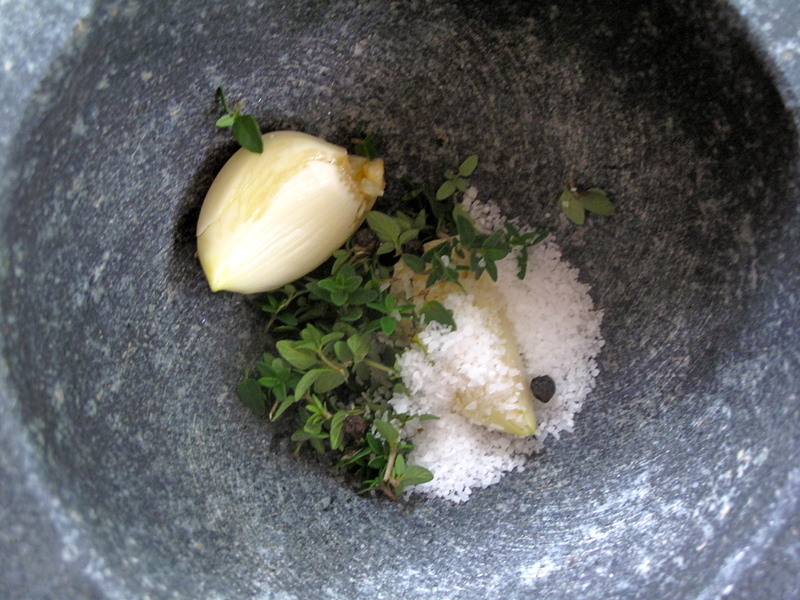 Place garlic, thyme leaves, salt, and peppercorns in the bowl of a mortar; mash to a paste. Stir in vinegar and olive oil. Season steaks with salt and pepper and place in nonreactive dish or sealable plastic bag. Add marinade and coat well. Refrigerate for at least 4 hours, or up to 24 hours, turning meat occasionally. Let meat sit at room temperature for an hour before grilling. I made hanger steak this way for dinner the other night, along with some chocolate pudding for dessert. When I asked my 3 y/o son if he was ready for his pudding he said, “Yes, but can I have some more steak first?” It’s a keeper!